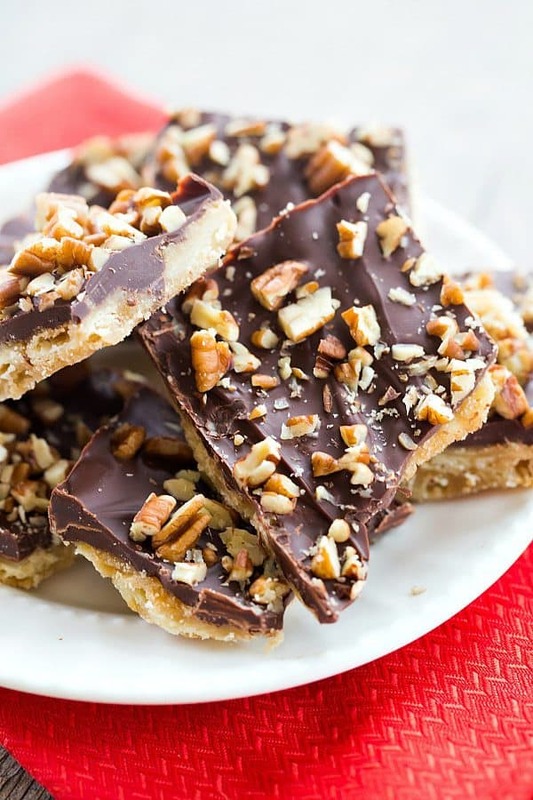 Saltine Toffee Candy – An easy toffee candy recipe made with saltine crackers as the base, topped with chocolate and chopped pecans. For as much as I love desserts, candy-making is one thing that I haven’t delved into much yet. For the most part, I stick to things like fudge and chocolate bark, but I’ve been wanting to branch out and try some different types of candy. I know that for many families, making toffee is a long-forged holiday tradition and it just wouldn’t be Christmas without it. Not only has my family never made toffee for the holidays, but I can’t ever remember having it, period – not in tins, not as gifts, not on cookie trays. Nada. As a result, I’ve been wanting to give toffee a whirl for quite awhile now, and I’ve seen versions of this saltine toffee recipe all over the place. I LOVE saltine crackers (with cheese, with pb&j, in soup, etc. ), so I thought that recipe would be a perfect place to start. 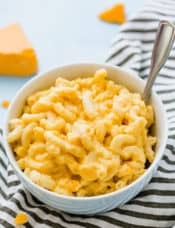 This was an incredibly easy recipe and I imagine it would be very simple to scale it up and make multiple pans at once if you are baking for the holidays. 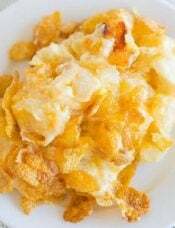 First a baking pan is lined with saltine crackers, then butter and brown sugar are melted together and boiled. That gets poured over top of the saltines in an even layer and then baked in the oven until bubbly. Out of the oven, chocolate chips are sprinkled on top and left to soften, then spread evenly over top. Finally, chopped pecans are added as the finishing touch before it gets shipped off to the refrigerator for an hour to set. 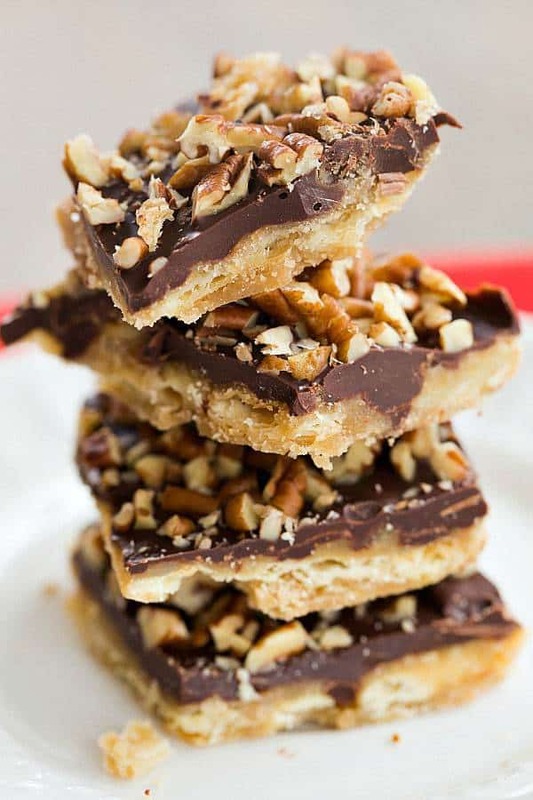 I love how the saltine crackers add a salty kick to counter the sweetness of the toffee and chocolate. I’m a huge sucker for the sweet and salty combo and this candy absolutely delivers. If you’re new to candy making or intimidated by using a thermometer, this saltine toffee is a great beginner recipe. I just may have to start a new toffee tradition of my own come holiday time! 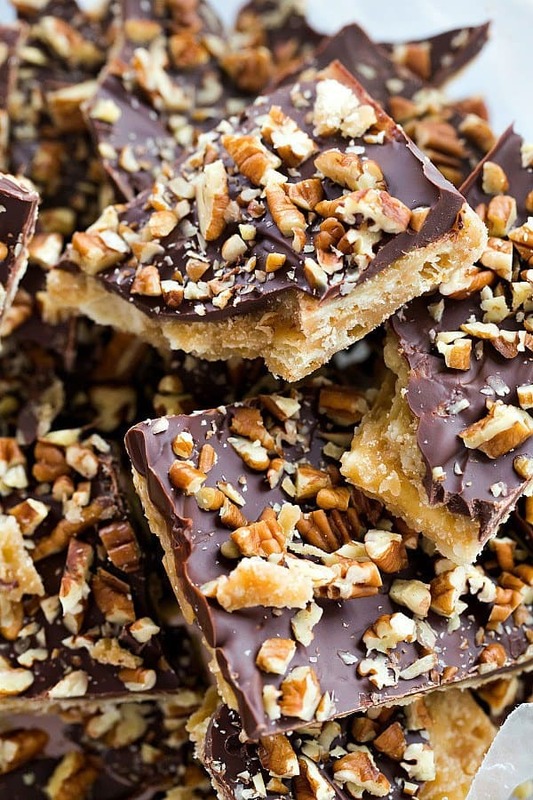 An easy recipe for toffee candy, combining the salty from saltine crackers with sweet toffee, topped with chocolate and chopped pecans. 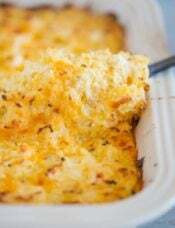 Preheat oven to 350 degrees F. Line a 9x13-inch baking pan with foil. Spray the foil with non-stick cooking spray. Arrange the saltine crackers in a single layer on the bottom of the prepared pan. Break the crackers in half if necessary to fit around the edges. Place the butter in a medium heavy-bottomed saucepan and melt over medium heat. Once the butter has melted, add the brown sugar and bring to a boil, stirring constantly. Boil for 3 to 4 minutes, or until the sugar has completely dissolved. Remove from the heat and immediately pour evenly over the saltine crackers. Use an offset spatula to spread it, ensuring that all of the crackers are coated. Bake for 8 to 10 minutes, or until bubbling. Remove from the oven and immediately sprinkle the chocolate chips evenly over the mixture. Allow the chocolate chips to soften for 3 to 5 minutes, then use an offset spatula to spread the chocolate into an even layer. Sprinkle with the chopped pecans. Cool at room temperature for 15 to 30 minutes, or until the pan is able to be handled easily, then refrigerate for 1 hour, or until the chocolate is set. Break into pieces and store in an airtight container at room temperature for up to 2 weeks. Okay, so I have made this recipe now twice. The first time I used a 9 X 13 pan, as the instructions indicate. I knew there was something wrong when the recipe said that I would use approximately 30 to 34 saltine crackers. If you use a 13 by 9 pan, then you will only use about 10:20 crackers. Needless to say the recipe made very thick almost brownie like squares. The next time I used the next size up pan. This still only used about 25 crackers, far less than what the recipe says will be used. 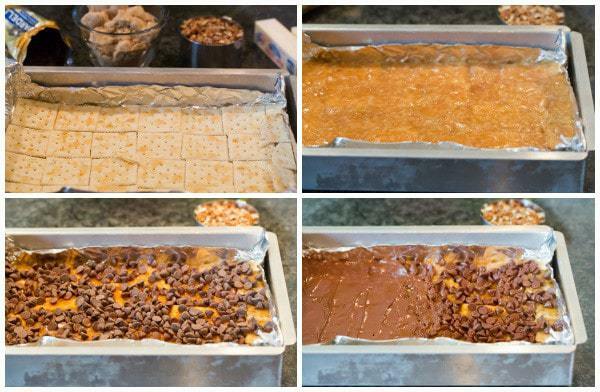 Again the recipe ended up making thick toffee candy instead of the nice thin toffee that is displayed in the picture. They were still delicious, but clearly there is a problem with the pan size indicated in the recipe instructions. Hi Ani, I’m sorry that you had some issues with this recipe, but that is definitely my 9×13-inch pan. Delicious! 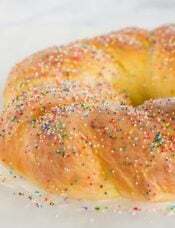 So easy but candy thermometer is a must. My apologies for that inconsistency! It should be salted butter. No worries. Thanks so much for the recipe and quick response. 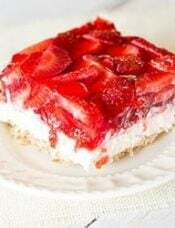 It’s a good recipe, but even better if made on a half sheet pan instead of a 9×13. The sheet pan provides a greater cracker surface, which means a thinner layer of toffee and a lighter, crispier texture. It is absolutely the best. Sweet , salty and the crunch from the pecans. Came out perfectly on my first try. I love to cook, but I don’t bake so I’m excited about this recipe I just made . So easy & so much fun! It’s become a must have for the holidays! I’ve used this particular recipe a couple of times since I was introduced to it at a cookie exchange. It never fails to turn out right every time. AND it’s a crowd pleaser. I’ve actually left off the pecans due to folks who might have allergies. STILL a winner. Thanks for sharing it with everyone. Mine were sticky when I broke them up. Am I supposed to store them in the refrigerator? They still tasted really good, but what did I do wrong, so I know for the next time I make them? Thanks ? Hi Carol, Oh no! I definitely stored mine at room temperature without an issue and they weren’t sticky. First, make sure that when you boil the butter and sugar it’s at a full rolling boil for 3 to 4 minutes and that all of the sugar has been dissolved. Then, the whole “bake for 8 to 10 minutes or until bubbling” – definitely make sure that it’s bubbling before you take it out of the oven. My friend made these for me & I can’t stop eating them. These are absolutely delicious & made with crackers & so easy. Going to make them for all my friends & family. 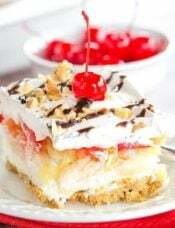 It was easy and tasted great! I made this for a company holiday potluck last week, but instead of pecans I topped with red and green M&Ms. They were a hit! I ended up using a whole back of chocolate chips as opposed to the recommended two cups and it definitely was too much. I didn’t realize there was such a thing as too much chocolate but apparently there is…so just heads up. Next time I think I would score it before breaking it up to keep all the layers together neatly. After 8 minutes, and you are finished adding chocolate, put the pan back in the oven for the remainder of the 10 minutes. It helps to melt the chocolate faster and is easier to spread. Could you replace the chocolate with butterscotch chips? Hi Bethany, You could, but I think it would be EXTREMELY sweet.